Since 1995, Whritner Builders has taken our clients’ dreams and made them reality. From the most elaborate ground-up, full-home construction projects to the most intricately detailed kitchen and bathroom renovations, they’ve built it all. Modern estates, eco-friendly renovations, country cabins, farmhouse redesigns: no project is too large to tackle, no task too small to be executed with style & perfection. See Residential Projects. 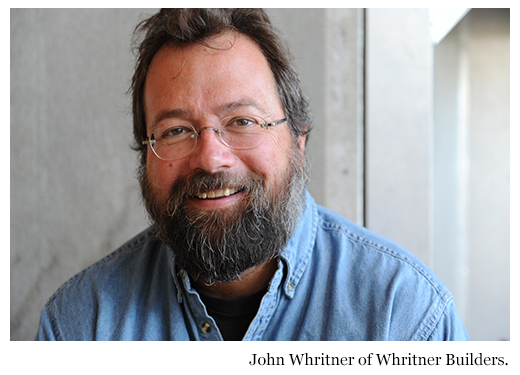 Led by founder John Whritner, Whritner Builders has the capacity to create whatever you want, however you want it. They work with your budget on your timetable so that home renovation costs are no surprise. John often serves as a hands-on general contractor, spearheading the project and making sure every last detail is right. He is comfortable executing the design of an architect, or working directly with the owner to draft and realize their home design plans. They’ve demonstrated an amazing flexibility and dexterity with home renovations and ideas: from cutting-edge urban-country kitchens to quaint mountain cabins to rolling estates for retirees. They’ve applied their construction skills to vacation homes, second homes, year-round homes, kitchen and bathroom renovations, exterior restorations, storage barns, not to mention several light commercial projects. Recently, they’ve expanded to the national stage, building and renovating houses on HGTV’s Cousins Undercover, Vacation House for Free, and America’s Most Desperate Kitchens — read more. Now the country knows what Catskills’ home owners have known all along: from kitchen renovations to bathroom redesigns to new home construction, you’re in great hands working with Whritner Builders! Over the past two decades, they have teamed up with some of the finest craftsmen and businesses in the Central Catskills. Through the years, John has assembled a trusted team of top notch sub-contractors: custom-cabinet makers, excavators, metal workers, heat specialists, roofers and electricians. Says John: “These are top-quality, detail-oriented people who I’ve worked with for years and trust.” With this outstanding team, they can complete your home renovation or construction dreams with the highest level of building expertise. They’ve brought the team to nearly every town in the Central Catskills – from Hobart to Gilboa to Roxbury to Dehli to Oneanta to Margaretille and Andes and beyond.